What a depressing book. A Russian business woman is arrested by the Russian police because her company makes a chemical that is a forbidden drug. No actually, she has all the officialv permits to manufacture the chemical, she's been doing it for years and it's not a drug. She is still convicted and stays in jail until she can find a lawyer who will take on the authorities. Just one of the many stories of life in Russia today. 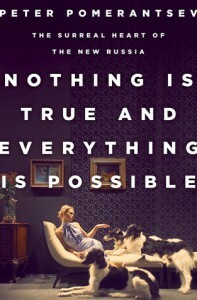 This is a book reveals how The Kremlin sits the centre of a spiders web of bribery and corruption, and controls media output, peddling myths and fantasies as truth. What is more, Russian oligarchs use their ill-gotten millions to buy up London - they are not investing in the UK, they are money-laundering. Anyone who has read, 1984, Brave New World or Fahrenheit 451 will find this book a chilling read.